I'm not putting on pants for that. 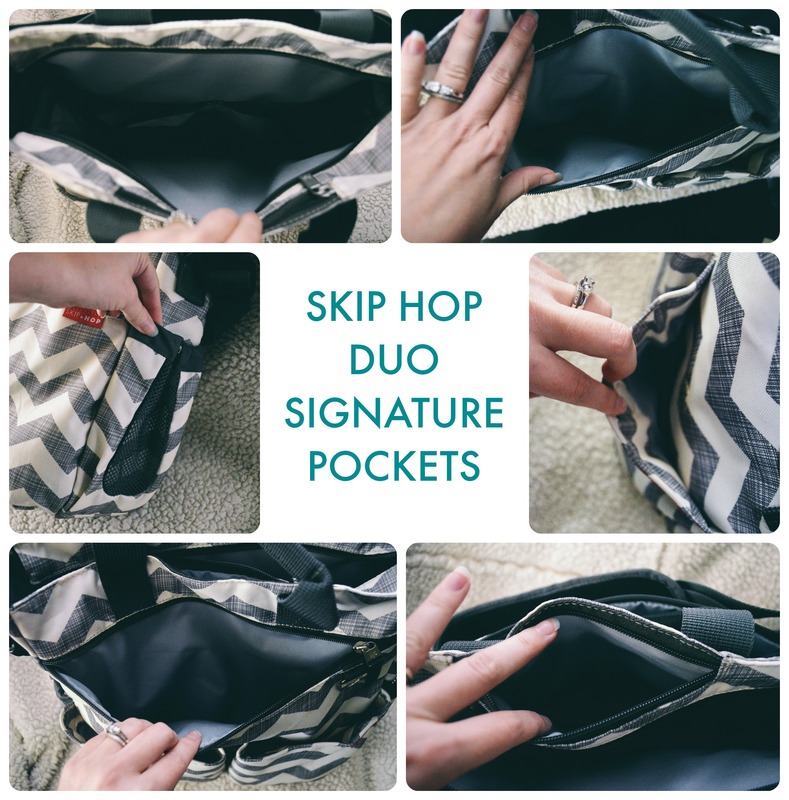 I recently purchased the Skip Hop Duo Signature diaper bag. I spotted a mom with one while we were out at a restaurant recently and instantly coveted the cute chevron print and the way it hung neatly from her stroller. It was compact! It wasn’t bumping against her knees! IT WAS CUTE! I tried to purchase it on Amazon, but the bag was sold out and small wonder. I got on the wait list and was very excited when a few weeks later, this bag showed up at my house. 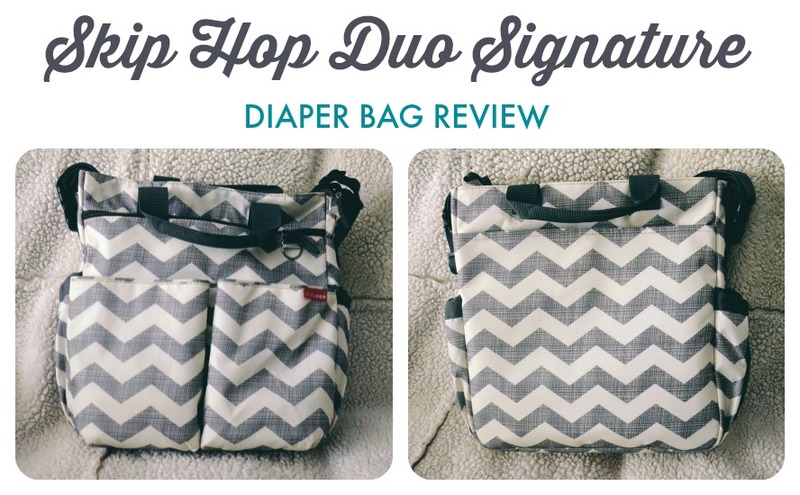 After a couple of weeks of use, here are my thoughts on the Skip Hop Duo Signature diaper bag. It doesn’t look like a diaper bag. I’m not a big fan of diaper bags that have a super baby-ish print or that scream “diaper bag.” This is a bag I can easily see graduating at some point from diaper bag to work bag. The chevron print is cute without being infantile, and there’s nothing about the exterior of the diaper bag that would make it an odd choice for a regular work bag. It clips easily onto a stroller. One thing I hate about our old diaper bag is that it doesn’t fit easily onto our stroller, which means when we are using the stroller and have to carry the diaper bag along with us, the diaper hangs length-wise between the handles and our knees are constantly bumping into it. It’s bulky and awkward. 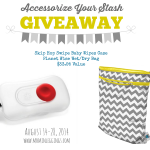 Skip Hop bags have these fantastic stroller handle clips, which make it easy to hang on your stroller, and the bag will lay flat. You just unclip the side straps and reclip them around the handles of your stroller. It comes with a changing pad. It’s always nice when your diaper bag comes with a changing pad and has an easy pocket meant for storage. I wouldn’t like having to buy the changing pad separately. It’s compact. Another complaint about our old diaper bag is that it is huuuuge. When you’re trying to walk through any narrow space, you’re constantly banging into people with it. This one is very trim, long and skinny. No more ramming total strangers with my diaper bag. There’s a good spot for my phone. This bag has a special, easy to access zip pocket that’s big enough for pretty much any smart phone. No digging around in the cavernous depths of my diaper bag or frantically searching through dozens of pockets trying to find my phone. It’s reasonably priced. It’s not the cheapest diaper bag out there, but at $60.00, it’s definitely on the lower end of price spectrum for diaper bags, especially considering the quality and cuteness. It’s small. Perhaps not surprisingly for such a trim diaper bag, it doesn’t fit a whole lot. 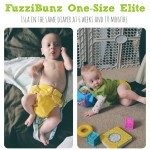 If you cloth diaper, and especially if you have two in cloth diapers, this bag may be too small. I definitely won’t be using this bag for long trips. It’s deep. Part of the problem with long and skinny bags is that you really have to stack things on top of each other to make everything fit, which means you spend a lot of time digging for stuff. Other long, skinny bags resolve this issue by having zip down pockets which make it easier to get to the stuff on bottom. This bag doesn’t. It’s a little annoying. There’s no insulated pouch. 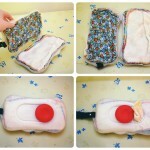 Insulated pouches are great for all sorts of things, including warm bottles and cold squeezies. It’s not a necessity for a diaper bag, but this is the first diaper bag I’ve had without one, and I am already missing the insulated pouch. There’s no pouch to store clothes. Again, this isn’t really a necessity, but it is my first time having a diaper bag without this, and I don’t like having a bunch of things like clothes just floating free in the diaper bag, because it’s more I have to dig through when I have to dig. I’ve taken a pouch from another bag to use for her clothes in the new bag. This would be a huge improvement for this bag, though. There’s not much pocket space. There is one big deep compartment in the bag with two pockets on one side and one small zip compartment just the right size for a phone. 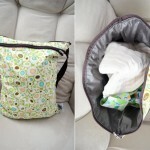 On the outside of the bag there is one large pocket on the back for the changing pad, a zip compartment on the front, two large pockets on front which close with magnets, and one drawstring pocket on either side. This is just not a lot of separate space for all the stuff I carry in my diaper bag, and I really miss having a small zip pocket in the large inside compartment to put things like chapstick, kleenex, spoons, and tampons. As is, I put the diapers, wipes, wet bags, and changes of clothes in the big interior pocket, Isla’s hat, sunglasses, bib, and baggies of crayons and spoons in the zip pocket on the front, and I use the remaining pockets for things like sunscreen and squeezies. I have to carry my purse separately, because there’s not enough room for my stuff (sunglasses, wallet, phone, keys, chapstick, kleenex, tampons, etc.) in her bag, at least not if I want to dig. 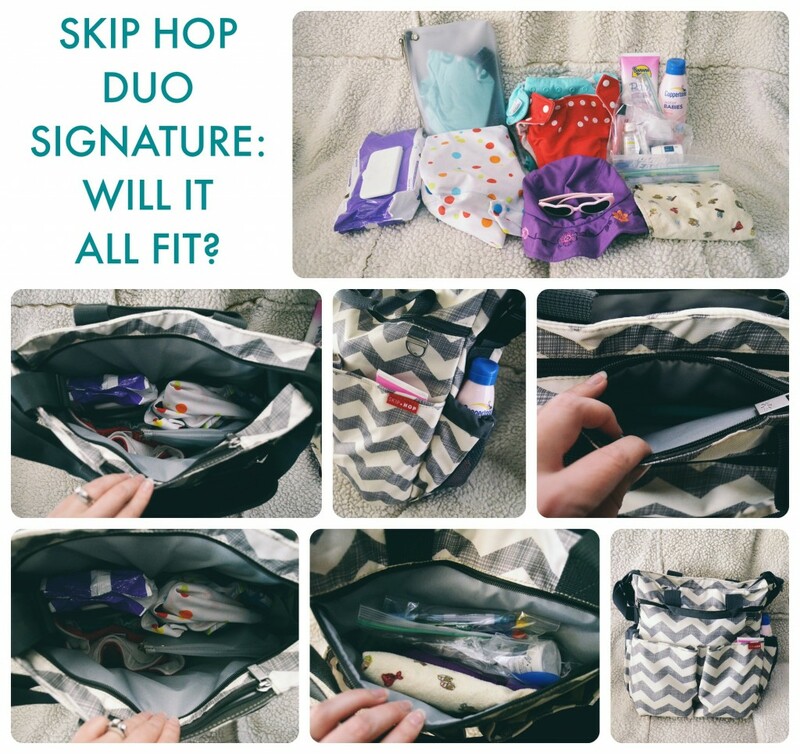 The Skip Hop Duo Signature diaper bag is cute and compact, but it has some serious size limitations and it’s difficult to organize and fit all of our stuff in this one bag. It’s not impossible to get everything in for a short afternoon trip, but there’s no way I could use this for an extended trip. I couldn’t imagine this bag working very well for one of our long plane trips to visit family in Oregon. If you only have one kid or you’re using disposables, and you’re willing to invest in pouches/baggies/containers for all your extra stuff, you could probably make this work. 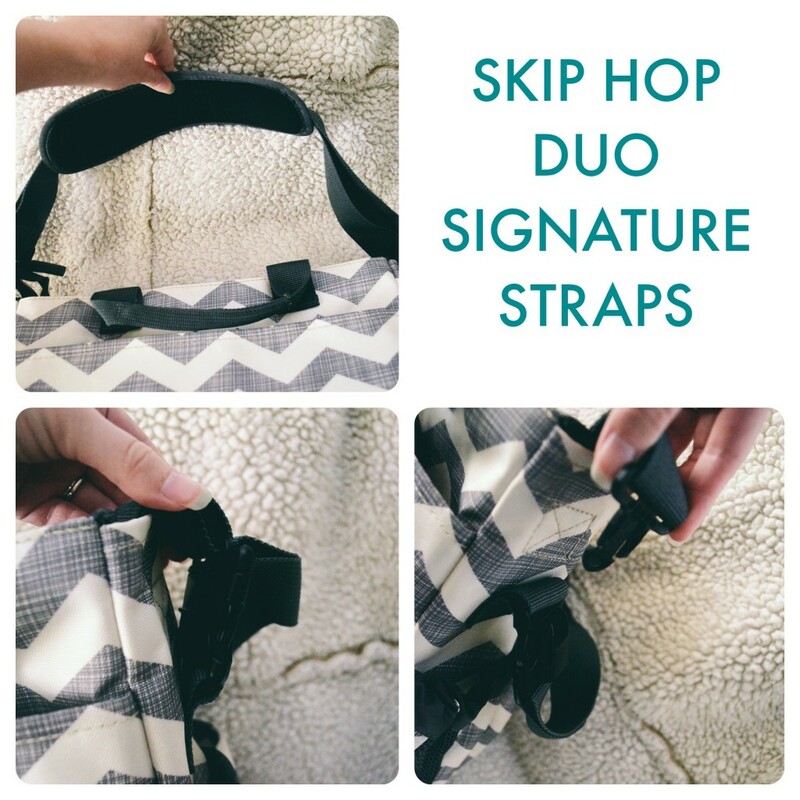 As is, in our house, the Skip Hop Duo Signature diaper bag will be used for short trips only. On the upside, it’s really cute and inexpensive. 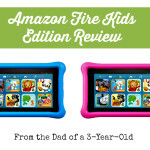 It’s compact, works wonderfully with my stroller, and is perfect for quick shopping trips or trips to the park or a play date. Plus, someday, when I no longer need a diaper bag, I could easily see using this for work. I love things that don’t cost a lot of money and have multiple uses. Depending on what you need your diaper bag for, and what kind of packer you are, this could be a great bag…or a not so great bag. Assess your situation, and if you just need an easy bag for quick trips around town, this is a great bag for you. If you’re looking for a monster bag to take on long trips, invest in something larger. Another pro: it’s gender neutral without looking sporty! That’s tough to find! I have the same bag and it’s great, most of the time. Not on road trips, but day trips are fine, as you say. I’ll skip this diaper bag then. If "all" is comprised of two kids, a dog, a full-time job, twelve pairs of maternity leggings (I'm not pregnant), and zero hobbies, I have it. Bad Behavior has blocked 246 access attempts in the last 7 days.